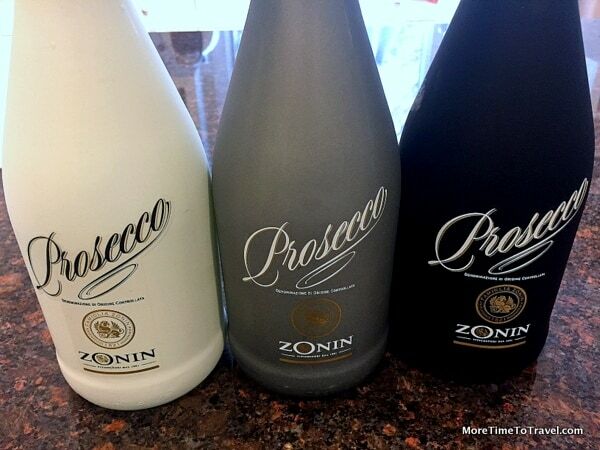 A Zonin Prosecco tasting at home gave us the chance to sip and savor a bit of Italy. Travel changes us in so many different ways. We find ourselves adopting habits and styles we’ve “picked up” in other places. Don’t get me wrong. It’s not all about gastronomy but learning about different foods, wines and spirits is one of the favorite “fruits” of our travel. We fell in love with Prosecco on one of many trips to Italy over the years. For those who haven’t savored it, Prosecco is a sparkling Italian white wine produced in the Veneto region. Its name is derived from the small village where the Glera grapes used to produce it were first grown. Prosecco generally tastes fresh, light and playful, and is lower in alcohol content than many other wines. Eminently drinkable, we equally enjoy it as an aperitif (before dinner) or paired with a light meal. Prosecco is also the primary ingredient of many wonderful cocktails, from the Bellini to the Aperol Spritz (stay tuned, our favorite Prosecco cocktail recipe to follow). Because Prosecco is relatively inexpensive compared to its rich French cousin, Champagne, and has been improving in quality, its popularity has been soaring in Italy as well as other countries where it’s imported, including the U.S. When friends recently visited from South Carolina, we weren’t quite sure of the timing of their arrival because of possible flight and/or weather delays. It seemed prudent to serve drinks and snacks to stave off our hunger until dinner was underway. Several months ago, the U.S. marketing company representing Zonin 1821 (an Italian vine growing and winemaking company) sent us three bottles of Prosecco from its limited “Dress Code” collection so we could sample and review the different varieties. This seemed like the perfect opportunity to organize an at-home Prosecco tasting. Before our friends arrived, we headed to our favorite authentic Italian deli (in New York) for an assortment of cheeses, meats and olives that would pair well with the chilled Prosecco. DOC (Denominazione di Origine Controllata) regulations, which ensure the quality and authenticity of Italian wines, allow winemakers to blend Glera grapes with a maximum of 15 percent of other varietals and still call it Prosecco. This led Zonin to create three new types of Prosecco, blending the classic version of the wine with Pinot Noir, Pinot Grigio and Pinot Bianco grapes. The colors of the three different bottles (black, gray and white) are inspired by the names of the grapes and are intended to convey different moods. We first sipped the Zonin White Edition Prosecco (made with Pinot Bianco) that is supposed to appeal to a “free, young, graceful, joyful and timeless” mood. The consensus: It was easy to drink but tasted more floral than classic Prosecco. Then we moved on to the Zonin Grey Edition (made with Pinot Grigio), which is supposed to evoke a mood that is “ modern, cool, informal, dynamic and urban’ mood. We loved the fruity, citrusy taste. Well, perhaps, the effects of the alcohol were additive or we succumbed to the alluring beauty of the black bottle. A bunch of nerdy scientists and mental health professionals, we couldn’t quite buy into the mood typology but agreed, hands down, that our last tasting was the best. As you might imagine, given the circumstances, dinner was a bit late but we had a great time exchanging tasting notes. Perhaps, we’ll repeat the experience in a blind, random-order tasting next time we see our friends. Making wine over seven generations since 1821 and headquartered in Gambellara, Veneto, Zonin is the largest private vineyard in Italy; the Dress Code collection wines retail at about $16.99 a bottle. Disclosure: As mentioned above, Zonin sent us three bottles of Prosecco for the tasting. Any opinions expressed in this post are out own. We first tasted this drink at brunch at Telepan, a farm-to-table restaurant in New York City that has since closed. Although simple to make, it isn’t a very popular drink so we were surprised when we ordered it again at another restaurant several years later, Sirio Ristorante, and the barman said he knew the recipe. It turned out that he used to work at Telepan. The drink is a less complicated variant of the French 75, also quite delicious. Combine the Saint Germain and lemon juice in a fluted glass. What a fun walk through one of my own favorite beverages! Thanks for the tour. Sounds like a really great party! We’ll have to have one together one day! I’m crazy about Prosecco too! Yes, you are invited to the next Prosecco tasting. Careful, I just might take you up on it. 🙂 Seriously, I do hope we meet up some day. It would be so cool to spend some time with one of my favorite travel writers.